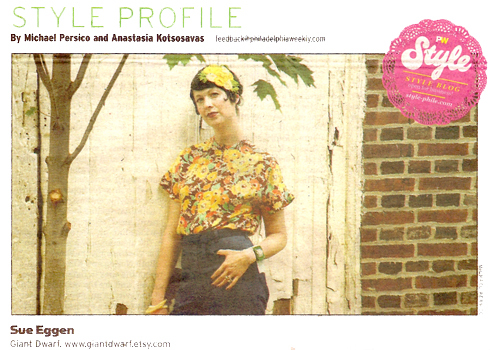 Philadelphia Weekly, one of the weekly publications here in Philly, contacted me in the beginning of August wondering if I would like to be featured in their Style Profile column. I was so excited to be in the company of my good friends Lara from Plaid Pony Vintage and Carrie from Fabric Horse. I knew exactly what I was going to wear to convey fall and my love of color. I dressed up in my favorite silk floral top from the 1940's paired with a great pair of vintage naval high-waisted jeans, butterscotch lucite bangles, an avocado ultrasuede + bakelite bracelet, and vintage leather oxfords. I wanted to wear something that represented Giant Dwarf as well, but the weather was still too warm to get all dolled up with cashmere on my crown. I decided to make a hairpiece using the applique from the Rosette Cloche with a band of elastic to hold it in place. It was the perfect solution! I made a few to sell at Crafty Bastards in DC and they flew away like swifts out of a barn! So many gals have a hard time with hats, but want to wear something pretty in their hair. I received an overwhelming response, so I decided to add the Rosette Fascinator Headband to my Etsy shop. I am happy to say that there will be some lovely looking ladies out there with fabulous flowers in their hair as the leaves begin to turn! One of those beauties is Sara from Girls Can Tell! I received an order from her a few days ago, and since we live about a mile from one another, I thought it was just silly to use the Postal Service. We decided to meet for coffee + tea at B2 in South Philly so I could hand-deliver her new Giant Dwarf accessory. I have run into Sara a few times at craft fairs, but we haven't really had a chance to get to know one another. I was so excited to finally sit down and chat about fun stuff like art + craft, craft fairs, and of course, Etsy. We had such a wonderful conversation that by the end of our visit I noticed that we didn't even get anything to drink! It was the perfect start to a new + wonderful friendship! I love hand-delivery too! I had coffee with a great customer a few weeks ago and it made me glad to be running such a hands-on business. Also, I need one of these fascinators. They are so so great.